Here are some articles focused on genomics, but with a few others on deforestation, ecosystem services, and sustainable agriculture. 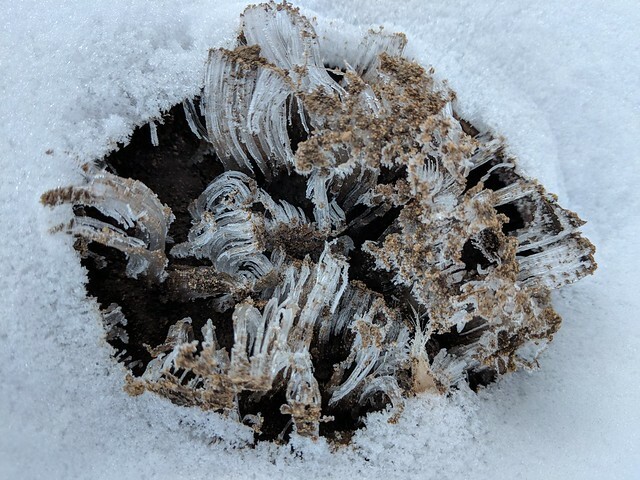 The photo above of needle ice in my backyard is totally unrelated, but I'd never seen or even heard of it, and I found it super cool. Read about it on wikipedia! Jokpe & Schoneveld 2018 is a close look at zero-deforestation commitments (ZDC) by 50 influential corporate "power brokers." They identify several problems with implementation gaps and externalities. In particular they note that a lack of traceability and transparency about where commodities are sourced from makes verification difficult (and most companies rely on asking their suppliers to honestly self-report deforestation). They also report that 3/4 of companies with ZDC don't require company wide commitments from suppliers (so those suppliers can just sell deforestation linked products to other companies who don't care). This one is long but worth reading for breakouts by sector and other useful info. Note that TNC in this article refers to transnational companies and not The Nature Conservancy. The problems and gaps identified are things we're hoping to address with the Accountability Framework (https://accountability-framework.org/), which should be formally launched this spring. There are many methods and tools to assess ecosystem services. Neugarten et al. 2018 is a report reviewing 9 assessment tools (EST, PA-BAT, TESSA, ARIES, C$N, InVEST, MIMES, SolVES, and WW) and providing decision trees on how to pick the right one for a given need. This is a fantastic reference for anyone working with ecosystem services, and it covers both written guidance documents and modeling tools. They recommend you identify the analysis question or need and think hard about expertise and resources you have to do the analysis before selecting a tool. Kofler et al. 2018 is an editorial on benefits and risks of altering the DNA of wild organisms via gene editing. They call for collective oversight to ensure careful thought is given to environmental, social, and ethical concerns, and especially to local community involvement in each decision to potentially release an edited organism (as well as international bodies like IUCN). They stress that "using this technology irresponsibly or not using it at all could prove damaging" - and give good examples of each. Sprink et al. 2016 looks at regulation of gene editing, and the difference between a process based approach (where the key factor is how an organism was modified) vs a product based approach (where the outcome is the key factor regardless of the process used). They argue that the European approach is outdated and doesn't reflect the continuum of modern technology (including several different applications of gene editing). They also dive into a legal argument of why it should be changed, and how it compares to the US and other countries. They make a good argument that regulation should be based on a genetic trait and product rather than the process used to develop it. This one is complex and wonky but a good reference, especially box 1 with definitions of several gene editing approaches. Halewood et al. 2018 is an overview of how CGIAR is looking to use crop genome sequencing to drive more crop diversity and find crop traits that can deliver better outcomes for people and nature. Most readers can safely skip information on specific molecular markers (e.g. Table 1) but should read page 372 which lists several applications of gene editing technology and genotyping. Zhong 2019 looks at how soy genotype and rhizobium inoculation (of seed or soil) impact plant growth, soy nodulation (the nodules help them fix nitrogen via bacteria), and microbiome. They found that the microbiome of soy varies depending on the genotype of soy. In particular whether the genotype forms high or low numbers of root nodules. Low-nodulation soy had more co-occurrence of the taxonomic groups (a more connected network) than the high-nodulation soy (figure 4). Both genotypes had their microbiome network connections increased by inoculation. The efficacy of the inoculant varies depending on plant genotype. See figure 1c / 1d for details. Low-nodule soy got a significant boost in nodulation from inoculation, but still had fewer nodules than high-nodule soy (for which nodulation was unaffected by inoculation). Both genotypes of soy got a roughly similar growth boost from inoculation. This means that to evaluate biological seed treatments / inoculation we have to look at the intersection of the inoculant, plant genetics, and baseline soil microbiome. Eichler Inwood et al. 2018 is a thoughtful review of several different frameworks to assess agricultural sustainability (in different contexts and scales). Table 4 is a nice summary of the 9 frameworks they cover, with Table 5 providing more details on how and where they work. None are ideal in every context. Thy conclude with recommendations about how to select a framework (see Table 6 for properties they should have), choose indicators, collect data etc. Jopke, P., & Schoneveld, G. C. (2018). Corporate commitments to zero deforestation: An evaluation of externality problems and implementation gaps. Occasional Paper 181. Bogor, Indonesia: CIFOR. (as you publish please email science_pubs@tnc.org to help keep this resource current). Questions, comments, suggestions, and complaints welcome. How many trees make a forest?